These worksheets review action verbs and linking verbs. 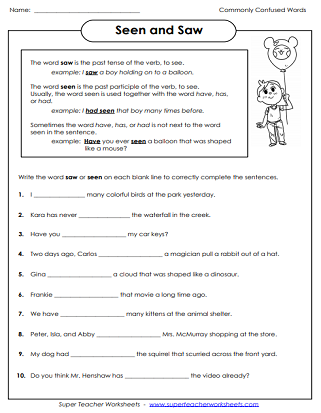 Many of the verb worksheets below are aligned with the National Common Core Standards Initiative. To display standards, click on the apple icon pictured below each worksheet's description. Part 1: Circle the action verb in each sentence. Part 2: Tell which words are nouns and which ones are action verbs. 2-sided worksheet. Underline the predicate in each sentence. Then write the action verb on the line. Underline the action verbs in this poem with a red crayon. Action Verb Poem: "My Dog Named Verb"
Students will underline the action verbs in this clever poem and compose an action verb poem of their own in this printable verb worksheets. Circle the action verb in each of the sentences. Read each set of words and pick the one that is an action verb. The first sentence in each pair uses a linking verb and adjective. Using the word bank, choose one action verb that can replace the verb phrase. Write the action verb on the blank line. Read each pair of sentences. Put a check mark next to the sentence that has an action verb. This activity has a series of questions about action verbs. Circle the action verb in the sentence. Then tell whether is it a past tense, present tense, or future tense verb. 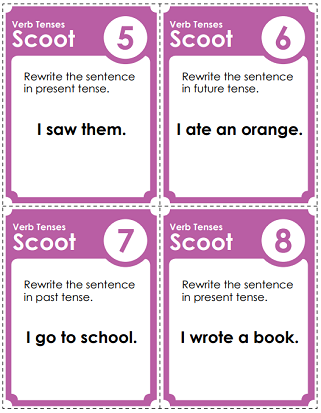 Complete the chart by filling in the correct verb tenses. In this game, students move around the room to find task cards with sentences on it. Students rewrite each sentence with a different verb tense. Read each sentence and determine the tense of each verb. Color the boxes according to the key and a lovely artistic design will appear. Determine whether each verb is written in the present tense form or past tense form (with -ed). Circle the correct verb (present or past) for each sentence. Students must make the subject agree with the verb in each sentence. Draw straight lines to match the present tense verb with its past tense form. Some past tense verbs have irregular spellings that don't follow the rule. Pick the irregular verb that best completes each sentence. Choose the correct irregular past participle verb to complete these sentences. Change the verb shown to past tense by adding -ed. Students will need to change the letter y to an i before adding -ed. Words include tried, buried, fried, and copied. Complete each sentence by adding -ed or -ing to the word in parenthesis. Sometimes verbs work together. Learn to identify a helping verb and a main verb in a sentence. Underline the helping verb in each sentence. Circle the main verb. This is an advanced-level helping verb worksheet. For each sentence, students must identify the main verb and helping verb. In the first part, students draw a line under the action verb. In the second part, they draw a line under the linking verb. 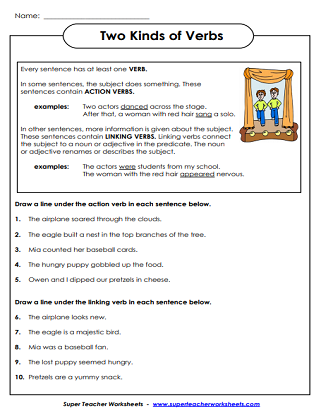 This basic-level worksheet is a good introduction to linking verbs. Circle the linking verb in each sentence. Read the sentence in each star. If the sentence contains an action verb, color the star red. If it contains a linking verb, color the star yellow. Read the sentence and determine whether the underlined word is an action verb or a linking verb. Read each sentence. Circle the linking verbs. Underline the action verbs. Then match the sentences with the pictures. Read each sentence and underline the verb. If the verb is a linking verb, write the letter L. If it's an action verb, write the letter A. Read each sentence and identify the linking verb. Sensory words- like tastes, looks, smells, sounds, seems- can be action verbs or linking verbs, depending on their context. Use the simple trick to determine which verbs are action verbs and which ones are linking verbs. Advanced level worksheet recommended for grades 5 and up. For each sentence, identify the simple subject, the linking verb, and the complement of the verb. Advanced grammar worksheet recommended for grades 6 and up. Choose the correct verb to complete each sentence. Choose between the words saw and seen. Practice using the verbs lie and lay correctly. Dogs bark. Cats meow. Turkeys gobble. Monkeys chatter. Match each animal with a verb to describe its sound. A series of worksheets to help you teach nouns, singular/plural nouns, common/proper nouns and more. Lots of worksheets that you can use to help teach your students about adjectives. Includes finding adjectives in sentences, comparative and superlative adjectives, and more!